The area north of the European Arctic Circle is the wildest, remotest and least populated area of Europe. Big road and other infrastructure projects in the area are last on the national lists of priorities. In the Nordic part the railroad ends in Kolari, in Russia the track ends northwest of Murmansk. Still, the level of technical prowess is on par with the rest of Europe. The level of standard service is second to none whenever it is decided. 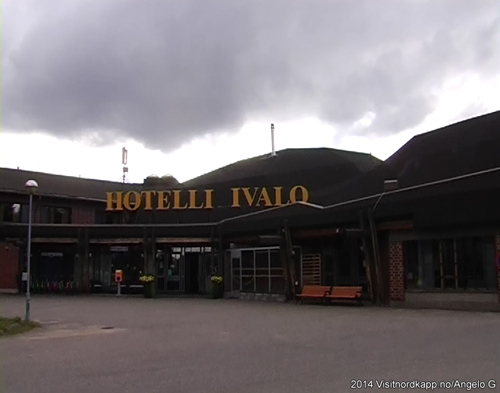 One of these places is Ivalo. In, what the ordinary globetrotter would classify as in the middle of nowhere, internationality will pinch you in the fingertips. Free Wi-Fi, international airport, and a staff with a better grip on English than your common taxi-driver at Paddington, London. After spending four hard-working days along the Santa’s Road on our Diamonds of the Arctic Tour 2014, we checked into Ivalo Hotelli. 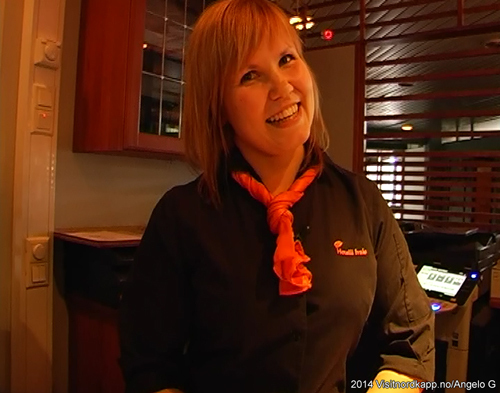 Before we kicked back, receptionist, Ms. Anna Lumisalmi nervously agreed to present the hotel for our film camera. One idea behind the tour was to have local and genuine representatives of the premises to talk about their service, culture, and/or nature. We have guest from all over the world. A lot of French fly in during the winter. The hotel has an excellent a la carte menu in its restaurant, a bar and a saloon. It is a lively hotel with a touch of night life. There is a small swimming pool and Jacuzzi in the hotel. (Editor: I don’t mention sauna, in Finland it is like tap water). We have the largest TV-screen in Ivalo (Ice hockey is big in Finland), a pool table, a stack of books, and even a shopping opportunity in the souvenir shop. Then we kicked back. I went to my room and I looked north at the Ivalojoki (river). The sun was shining at 20 hours and was reflecting in the water. All of a sudden, I saw a shade of something big moving in the river. Is it the Ivalo Monster? No, it was the head of a swimmer. The woman swam for quite a while before she returned to the hotel dock. Normally, this would be a rather cold swim. But it had been + 20 degrees for weeks and it was still warm. Nothing to it, I concluded. Anyway, I was inspired and went to the hotel swimming pool. It was possibly cooler than the river. A few strokes, and then I headed for the sauna. After a few minutes, a group of Finnish men came in. I struck a conversation with one of them. They were just passing by, he said. 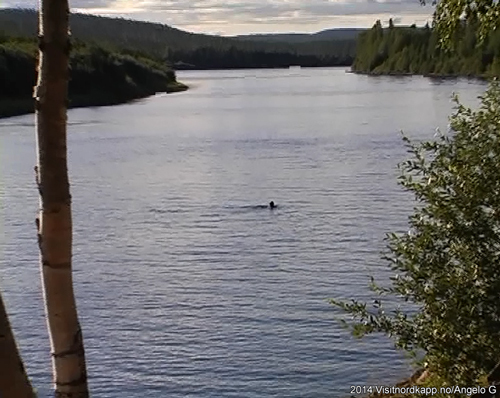 Tomorrow we will go towards the Russian border and fish in the Inari Lake. (This is really a wild place, even by Finnish standards). We have been going there for years. We are going to Nellim. So am I, I told him!